This morning the Digital Teachers (DTs) at the American School Foundation of Monterrey, met for our bi-monthly morning meeting. The DT role at ASFM is an applied position for teachers interested in taking on leadership responsibilities with technology. DTs are their grade level’s “go to” person for technology needs, they provide staff with professional development, and are often the school’s guinea pigs for sandboxing tools in the early adoption phase. Today, the Tech Integration Specialists provided the 14 member DT team, with a Quick Fire Challenge. A Quick Fire Challenge (adapted from the TV show “Top Chef”) is a task presented to a group with a limited amount of time and particular parameters for completion. 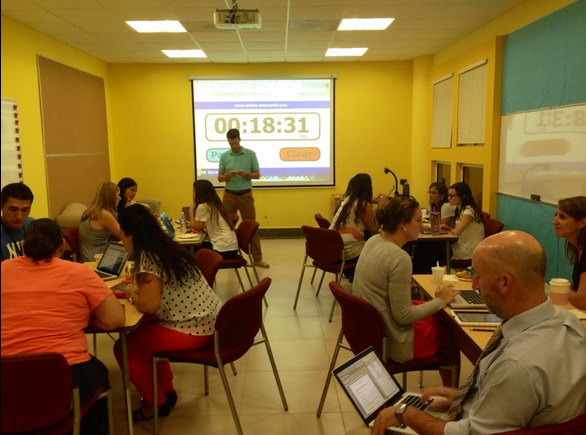 Prior to the meeting, digital teachers were split into 4 groups and pre-assigned an article to read, taken from one of our favorite resources, Edudemic – Connecting Education and Technology. After a few nuts and bolts were discussed, groups were given 20 minutes to create a visual of the key points from their article. They were then given 2 minutes to present their creation to the rest of the team. We provided DTs with the choice between 3 different creation tools/apps for an iPad to present their findings: Penultimate, Haiku Deck, and iMovie. It is okay to be outside of your comfort zone. When testing new tools and being rushed with time, learning still takes place and we let go of the need for perfection. Learn from the mistakes. It is important to test tools prior to using them in the classroom. Some DTs found it difficult to use a particular presentation tool they had committed to, and reflected on the importance of choosing the best tool to match the content that is to be presented. There was a common theme among each group beginning the activity. They started out by discussing the content they would present, then selected a tool to host the content. This is especially important to consider when selecting tools for learning. Think content and pedagogy, then find the appropriate technology. Taking risks is important, especially as leaders of technology use at ASFM. We need to be a model for testing tools out, learning, unlearning, and relearning. The Quick Fire was a new activity to the DT meeting this week, and based on the reflections from teachers, it was an activity that proved valuable and one we may return to later down the road. Below are links to the articles and results the DTs produced and shared. The Anti-Education Era by James Paul Gee is a book that received mixed reviews from students in our MSU, MAET Year 1 group. Gee separates the book into two sections, 1- Describing “How Stupid” humans are, and 2- Informing “How People May Become Smarter Before it’s Too Late.” After skimming and reviewing the first section, paying particular attention to a chapter titled, “Institutions and Frozen Thought,” I felt Gee made some valid points. According to Gee there are limitations humans face that prevent us from solving large, complex problems. He discusses this idea in the chapter on “Institutions and Frozen Thought,” where he writes how institutions were created to solve a particular problem. Institutions, (such as a school) are in existence as the poor solution to a problem whose other solutions seemed even worse (Gee, p. 88). This coincides with the idea of a “Wicked Problem” as all stakeholders and positions are taken into consideration, and the best possible response to this problem (in this instance) is the creation of an institution, or school. The issue institutions contain with moving forward and solving problems, is that many institutions freeze. Freezing takes place when the initial purpose for the institution is no longer being addressed (Gee, p 87). Gee uses the example of colleges. He states colleges were created to train religious thinkers, later they evolved into the training of secular priests, and now they are at the point of developing students interested in “beer and bodies or getting a good job rather than knowledge” (Gee, p. 87). After witnessing the change in outcomes colleges have produced, there is the need for a change in their purpose, as the demands of society have changed. Yet several universities remain “frozen.” Teaching students in the same manner as years past and preparing them for jobs of the past, has not proved valuable. Therefore, institutions are one factor in preventing society from solving complex problems. Just as in a wicked problem, the institutions need to adapt their system and purpose for everyone involved so that the advancement of students will continue and humans will be come smarter together. But when we say “colleges,” we really mean the people running them. The administrators, professors, and even the students. Each of these groups of people have the ability to create change. Now, not everyone is aware of the frozen thought and the harm it is causing the world, and there are even some people who may not want to see or deal with the problem. However, there is a group of people who are reflective enough to see the opportunity to make changes, and those people have a responsibility. A responsibility not for their own individual advancement or fame, but for the betterment of all humans (Gee, p. 152). To solve complex problems smartly, they need to focus on the best idea, rather than the best man (Gee, p. 153). Gee compares the act of collaboration with ants, “Looked as an isolated individual, an ant is a pretty pitiful thing. But looked at as part of an ant colony, the ant is very impressive indeed” (Gee, p. 152). This idea also connects with How People Learn, in regards to the strengthening of ideas when people build on them together and work collectively toward a larger goal (Donovan, S., Bransford, J., & Pellegrino, J., 2000, p. 25, Pollock, 2007). The authors of both books stress the importance of experiences an individual brings to a given situation, and also value the work that may be accomplished by groups of individuals. I feel these groups coming together are working for the good of humanity, rather than an individual. In regards to solving complex problems, on top of collaboration there are even more advantages humans have today than we did in the past. We have technology. To further our advancement, humans have the opportunity to synchronize their intelligence. What this means is meshing the strong human idea with a meaningful tool (Gee, p.174). Technology or the internet can be one of these tools, to assist with spreading ideas and connecting people with synchronized minds, providing them with an expansive platform for communication and collaboration. Through communication and the growth of their ideas, humans have the ability to create affinity spaces, where learning is taking place for the advancement of the local, national, or global community. There is a natural interest to accomplish great work when the passion comes from within (Gee, p. 174). When these affinity spaces are functioning with multiple minds and multiple tools, they are at their best, making people smarter together, and providing them with the capability of solving complex problems (Gee, p. 174). Gee, J.P. (2013). 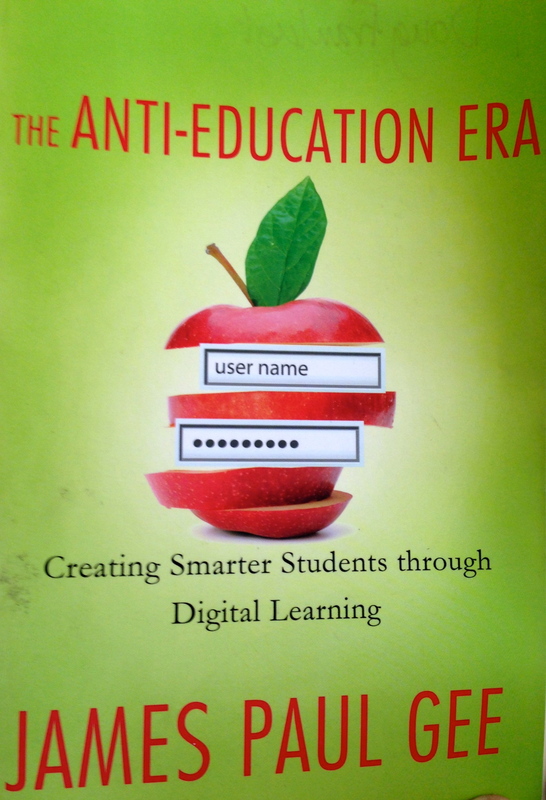 The anti-education era: Creating smarter students through digital learning. New York: Palgrave MacMillan.